As I crossed through the park on my way to the Starbucks on the corner of 15th and Union Square, I became filled with admiration for New York. It wasn’t the mild and sunny day, beautiful tall buildings, or the statue of George Washington that did it — it was the naked trees. Growing up in Central Florida, the variety of trees ranged from palm and pine — and let’s face it no one likes pine trees, they’re the green-headed step-child of Mother Nature, and palm trees wear thin after a few weeks of nothing else. New York’s parks, on the other hand, offer a variety of trees that are visually appealing even when bare. And those who feel confined by the skyscrapers and flashing lights need only to walk to Central Park to get their nature-fix. 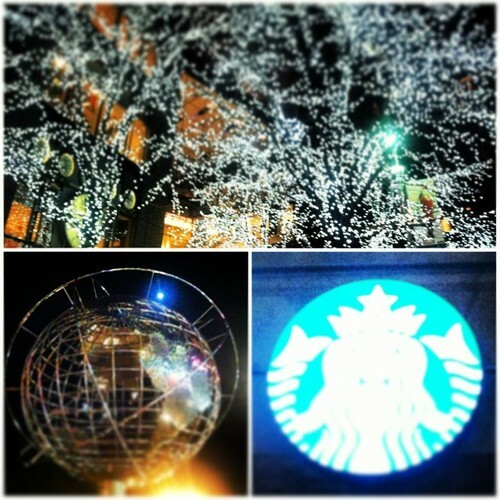 Of course, I didn’t move to NYC for the trees… I moved for the Starbucks. Obviously! This location is a mixed bag of sorts. Although it’s a very large store, it is also mere feet from one of the Union Square subway entrances — really bringing in the masses. There are three separate seating areas strategically spread throughout the space, but they’re strictly business — no comfy chairs in sight. The barista bar is placed in the center of it all, with a well-structured line system for tackling the large crowds. Only problem is the registers are a good 10-15 feet from the front of the line, sot the baristas almost have to shout to get the attention of those not acquainted with how a Starbucks line should work. If I lived in the area this would be a hit & run Starbucks only — but you can always take your coffee to go and sit in the park to admire the trees. I walked in and was struck with deja vu — I’ve been here before! — I suddenly realized. 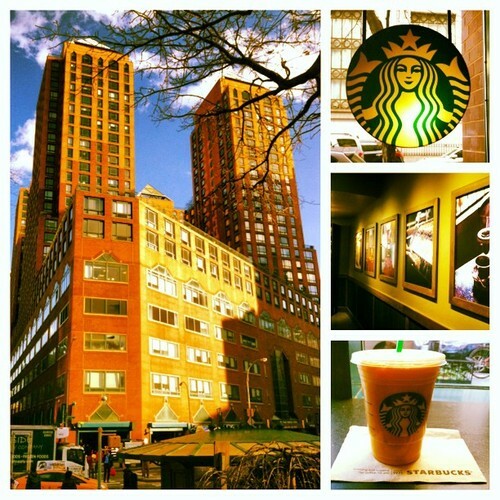 Back in my NYC infancy I found myself at this Chelsea Starbucks while apartment hunting throughout the city. I remember sitting in the lounge area while a homeless person came in and slowly and discreetly made his way through the patrons asking for money. It took about 2-3 minutes before the baristas realized and had to ask him to leave. Now, nearly 6 months later, I find myself sitting in the same exact spot — and at the same time, in a very different position. Then I had no idea that I was sitting in Chelsea — or what Chelsea really was — for that matter. Neighborhoods? Boroughs? 1,2,3? A,C,E? Moving to New York can feel like learning a new language, and in fact I’m still learning to this day. And although I dropped out of German III in high school, the language of the city is one I plan to follow through to its completion. The more I sit here, the more this Starbucks begins to remind me of the stereotypical grandma’s house — without the plastic-wrap on the furniture, that is. The dim lighting, dark accenting walls, and floral patterned sofa just scream old lady to me. Don’t let that deter you though; just like grandma’s house, this Starbucks has plenty of room for you to come and take a load off. 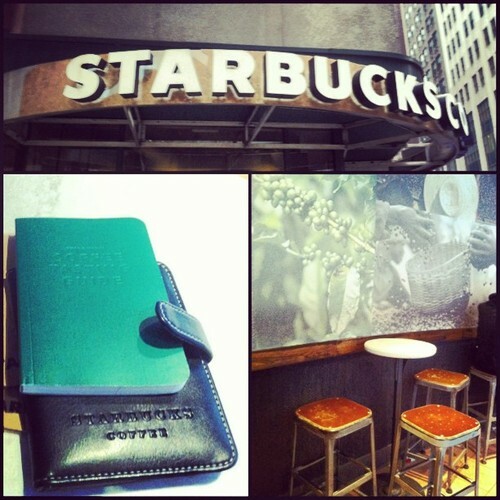 Today I received a special package from the Regional Vice President of the NYC Starbucks: a Starbucks Coffee Passport. This tiny booklet is designed to allow those with a passion for Starbucks coffee to get an in-depth view of how their brew is created, differentiate between the different types of roasts, as well as record their thoughts and opinions in the Coffee Tasting Guide. I must admit, I’m very honored to have the support of Starbucks as an organization when it comes to what I’m doing here on this blog. Although I won’t allow this to dictate my opinions of the Starbucks I encounter here in NYC, it’s a good feeling none-the-less. Speaking of — I’m currently squatting at another Times Square location. This is a location I’ve been to many times before, since it’s placement to the Times Square subway line is so convenient. It is probably the most cramped location in the city, but at the same time, the space is filled with plenty of seats for those looking to rest their feet a bit — so it’s useful clutter, at least. In fact, I’ve never really needed to wait for a seat; waiting for the restroom on the other hand, well that’s a different story. The doors are open til 12am nightly, so come and see for yourself. Yes, two in one day — And if you’re judging me, so be it, because I know I’m not the only New Yorker out there who measures their days by the cups of coffee they drink. Also, I’m on a deadline! In actuality, I simply found myself in the Starbucks located on 42nd & 6th and couldn’t resist writing and reviewing it tonight. This location is unique to me for several reasons. It is the smallest Starbucks I’ve ever entered. It has no seating. It has no restroom. And — for some reason — I can’t hold any of those things against it, because it is one of the fastest locations when it comes to service. In all honesty, this Starbucks reminds me of my first NYC apartment in the Upper West Side. All there was to it was a small triangular living-room/kitchen combo that we were able to squeeze a futon and a table into. This Starbucks contains a barista bar and a station to fix your drinks at, and that is all. You exit where you entered, so the crowd shuffles in an acute circular motion before being thrust back into the streets. The closest Starbucks in proximity to Bryant Park (and the B/D/F/M trains), this location receives quite the crowd. Very close-by are other landmarks such as Times Square, Rockefeller Center, and the New York Public Library. Also, here’s a piece of trivia for you: the icon of this blog is the Starbucks logo from this location, and the building in the background is the NYC headquarters to Bank of America. Yeah, I know I probably shouldn’t lead with that statement, since its relativity to this blog is reaching at best, but the fact remains: It is indeed snowing. This being my first winter up north, I have yet to inherit a prejudice toward this white substance that falls from above. When a seasoned New Yorker says “It’s snowing,” the statement comes out a guttural growl of disdain; coming out of my mouth, the words crack the edges of my mouth into a smile and turn my eyes into saucers of glee. In a year or so, I’ll probably assimilate with the masses and learn to despise the snow, but until then I’ll allow my Floridian instincts to fill me with wonder at the sight of this strange-white phenomena. 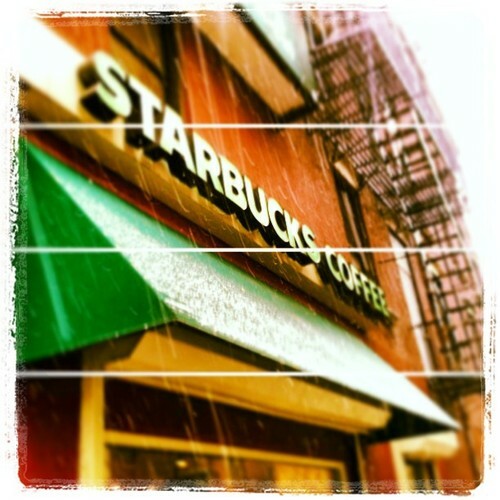 Shielding me from this Winter Wonderland today is the Starbucks on the corner of 66th and 3rd. Back in the Upper East Side again, this Starbucks is starkly different then the location on 69th and 1st that I visited previously. Whereas the other location was an excellent spot to sit and read or write, this store seems to be strictly business. Those walking in aren’t really looking for a cafe, they’re looking for their coffees, their lattes, their sugary pastries, and they’re looking for them fast. No fuss, no muss. Get in, get out. But of course IF you were looking to sit down for a spell, there are a few tables toward the back as well as bar seating lining the windows. Of course, it’s my personal goal it sit and observe all the Starbucks in Manhattan, but if you’re not me (which I’m assuming you’re not…) you might be best finding another location that has a little less traffic and a little more seating. Times Square — synonymous with towering skyscrapers, bustling crowds, Broadway shows, flashing lights — and dozens of Starbucks. If NYC is in fact The City that Never Sleeps, then Times Square is one giant nightlight. Whether it be midnight or 5am, if you take a stroll around the cross-section of Broadway and 7th Avenue you’re bound to be bathed in the bright lights of the city. It is indeed the most iconic landmark in the city and arguably an international reflection of America itself, but for a New Yorker Times Square is definitely an area you’ll go out of your way to avoid if you have the choice. Once Broadway shifts from a trafficked street to a painted blue concourse of pedestrians (at this very street corner, actually) it can seem like quick sand to those of us just passing through. Stuffed with gaggles of tourists, giant dancing Disney characters, and over-anxious solicitors selling tickets, the area makes those of us simply looking to catch a train or get to work bite our lips and hold our tongues. 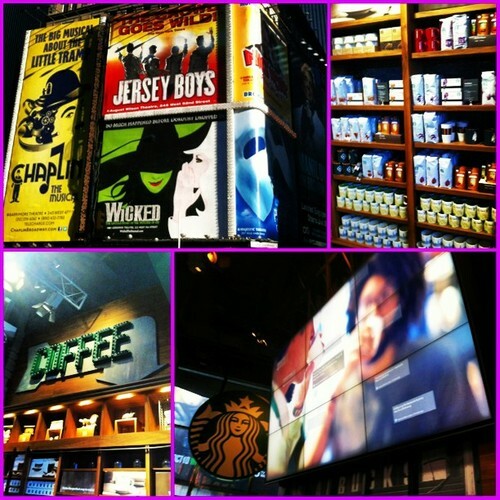 One perk: there are Starbucks everywhere! And the one on 47th & Broadway seems to be the grandest of them all. Positioned directly across Broadway from the TKTS booth — where anyone can pick up discounted theatre tickets day-of — this location clearly aims at being a landmark in itself. Upon entering and taking in my surroundings, I was immediately impressed. Placed directly in front of the entrance-way is a large multi-screen digital display, where live-tweets to #Starbucks flash on the screen. Below this are are several interactive touch screen monitors allowing visitors to browse through a New York Times archive of news and images of Times Square throughout the 20th century. Other amenities include a gift shop for a variety of merchandise, a bar exclusively for grinding coffee, and long-glass walls lined with counter-tops allowing you to take in the bright lights of the area. Clearly not designed for those who wish to sit down and enjoy their coffee, this Starbucks clearly caters to the masses that are looking for a quick reprieve and a warm beverage before jumping back out into the torrents of sightseers. But, hey! Why not stop by on your way to a Broadway show? 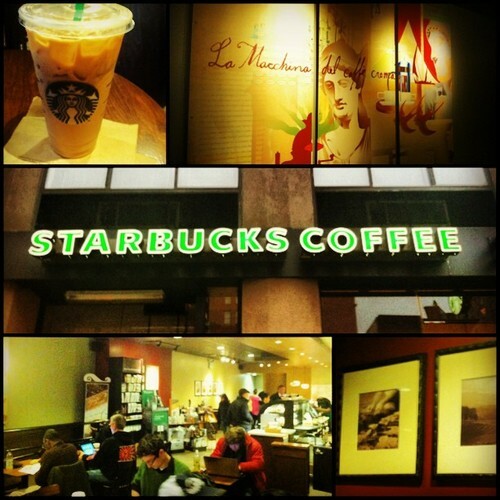 The Starbucks at Columbus Circle and I have a little bit of history. In fact, you could say it was the early inspiration for this blog. After graduating from the University of Central Florida in early December of 2011, I decided to reward myself by spending a 5-day streak in NYC with two of my best friends. At some point we ended up at Columbus Circle shortly after midnight lost and searching for a bar that seemed to be evading us. 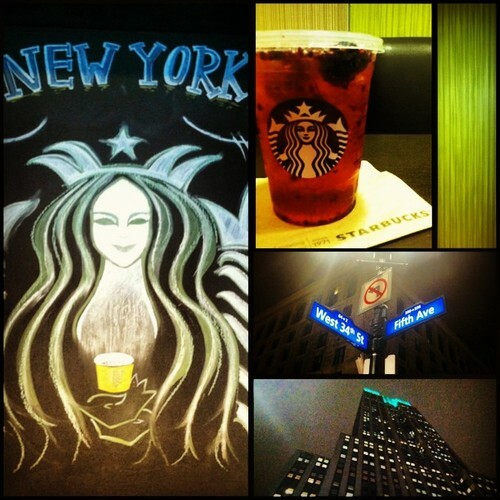 So, we dived into the Starbucks on 60th and Broadway to escape the cold, refuel, and recalculate. Already a regular Starbucks devotee, I had developed a set expectation of what I would find in each location, and the NYC Starbucks locations were dispelling it left and right. At this particular location, after waiting an excruciating amount of time for two lattes, my friend and I started talking about how the NYC Starbucks compared to the locations in Florida. Just over a year later, I sit here in the same city that I can now call my home — at the same Starbucks that set things in motion. If you’re unfamiliar with the Columbus Circle area, just know this — it’s busy and beautiful. At the south-west corner of Central Park, the circle has become an iconic landmark — fully equipped with picturesque statuary and shops to keep you busy. It is also a large transportation hub for both buses and subway lines. So how does all this reflect on the Starbucks on the corner of the circle? — Not well, unfortunately. Well — I can’t say it’s the worst. After all, I still have 189 to go! But it’s definitely not one you’ll get in-and-out of quickly nor is it suitable for an easy sit-down. Maybe it’s the Starbucks sent to teach New Yorkers patience? Back in Midtown, a friend and I ducked into the Starbucks on the corner of 52nd and 7th to avoid the bone chilling wind that we had inappropriately dressed for. This area of 7th Ave brings both the theatre crowd and the business crowd at once. This particular Starbucks is weaseled into the AXA Equitable Center, and like most office building cafes, this one had very little to brag about. After ordering a set of hot coffees to warm our rattled bones, we sat in the small seating area only to be unpleasantly surprised by two things: there is no bathroom at this location, and each time the door is pushed open by someone depraved of caffeine a torrential gust of cool wind blows through the tiny seating area. And these effects only amplify one another, since tourists and New Yorkers alike are constantly running into this Starbucks (and all Starbucks) for the sole purpose of using the restroom only to be turned away a second later, causing another brief 30 degree drop in the temperature. At one point, my hat and gloves were literally blown away due to this horrible cross-breeze effect. However, the breeze was not what bothered me most about this location. It was the fact that it was designed with an upstairs seating lounge connected by a spiral staircase — only for it to be blocked off and used for storage (I presume). So whatever redemptive qualities that may have been lurking up there were lost. If you work in this office building, Congrats!, you can grab yourself a Starbucks coffee at ease, but this isn’t the type of location I would recommend seeking out. 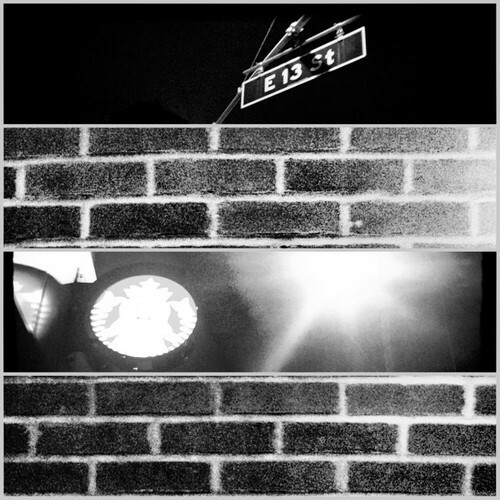 Everybody has heard of the Empire State Building — but how many of you are familiar with the Starbucks at the base? 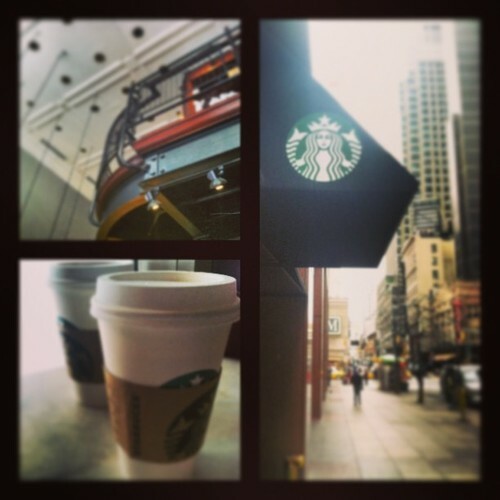 Yes, Starbucks has even infiltrated one of the most grand and iconic structures located in Midtown Manhattan. Midtown certainly wins the award for most congested neighborhood in the city. Blending tourism with the white-collar workday, the Midtown foot traffic is enough to turn even the most tranquil person into a maniac. My daily trek through Midtown often reminds me of my old days of driving on I-4 in Florida: zigzagging and weaving through the slower traffic to get where I need to go. This particular stretch of 34th Street houses some of the biggest retail flagships, from Aldo to Zara, and just a block away from Herald Square and Penn Station. But luckily, this Starbucks comes fully prepared to tackle the enormous crowds that the tourist sites of midtown bring. A split-level cafe, this location offers plenty of room for those just passing through or those looking for a seat. A passerby can get in and get out, while someone looking to take a seat need only to walk down to the lower-level. There exists the largest seating area I’ve seen at any Starbucks to date. It is also noteworthy that this is the first location that has a revolving door to help control the masses of in-comers and out-goers. Also, two gender-specific bathrooms and an army of baristas help quell the lines that would otherwise force themselves out the door and into the street. So — if you can cut through the masses of people outside — this is a promising Starbucks to utilize. Leave it to the East Village to put an unconventional spin on something as conventional as Starbucks. The East Village is known throughout Manhattan for it’s artistic and avant-garde edge. Individualists and creative types flock to the East Village to live the bohemian lifestyle. In fact, I can practically feel the neighborhood’s disapproval as I write these categorizations into existence. The East Villagers — and by proxy the village itself — defies categorization. So don’t even try. Kay? However — in all seriousness — the eclectic culture of the East Village is one of my favorite things about Manhattan. Even those that don’t want to fit in, in fact, do have a place they fit in. 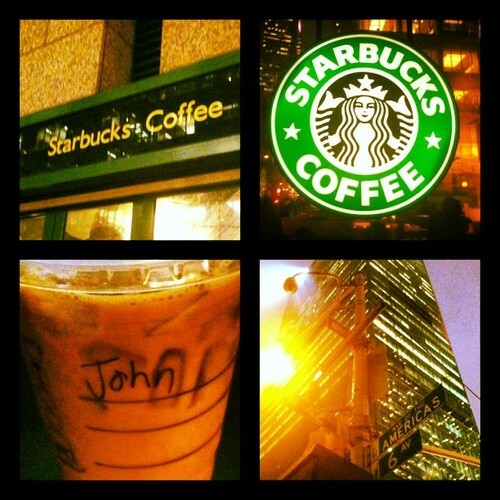 So how does Starbucks — the typical corporate coffee house — blend in such an individualistic neighborhood? As I walked in to the location on 13th and 1st, one of the first things I noticed was the lack of chairs. Instead, lining the window of their long wall is this tall-bench/short table contraption that the patrons were sitting on, legs crossed beneath them. In fact, that’s exactly what I am doing right now. And besides my paranoia that I may drop my laptop or kick over my coffee it ain’t half bad. But for those of you that like to stick to the straight and narrow — not very East Village of you, BTW — there are a couple of chairs lining the barista-bar and the the tiny window in the front. Best served as a quick pit stop for your morning coffee, but it’ll work as a place to sit — Indian-style that is — as long as okay with your feet falling asleep.